Art Show in Estes Park! So, my sculpture is going to be shown at the Cultural Arts Council of Estes Park for a month and it’s great to be included in this show because its all about wild horses. A percentage of the purchase price of the art purchased at this show benefits the Cultural Arts Council of Estes Park which is a publicly supported 501 (c)(3) non-profit organization dedicated to supporting all disciplines of art in the greater Estes Valley, providing an affordable cost visual and performing arts programming year round, and acting as a vital information and support resource for the arts community (similar to a “Chamber for the Arts”) for the greater Estes Valley. All the money that is collected as donations during this show will go to support The Cloud Foundation, named after the wild stallion you see pictured here. Isn’t he beautiful? 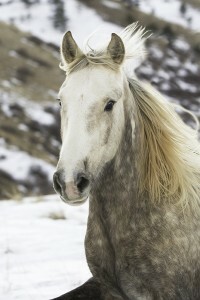 He is actually a very well known wild horse and has starred in several films produced by Ginger Kathrens. His family (yes wild horses exist in families just like us) has been disrupted by the “management” of the Bureau of Land Management for many years now. This cause is something I support as I have time to support it; I sculpt wild horses, speak to wild horse advocacy issues in my blog, talk a bit about it on my website, send letters and make phone calls to Washington…I don’t feel that it is enough, but if every one does what they have time to do, it can make a big difference for these beautiful animals that are a cherished part of our world. I sure am excited to be included in this show! Ginger Kathrens, Emmy Award-winning film-maker and Executive Director of The Cloud Foundation, will give a presentation. Don’t miss this opportunity to learn more about her life with the young wild palomino colt she named Cloud, the Pryor Wild Horse Herd, and her fight to protect our American wild horses. New! Mica and other mustangs will be available for a meet and greet in front of the resort starting at 5:30pm before the talk. 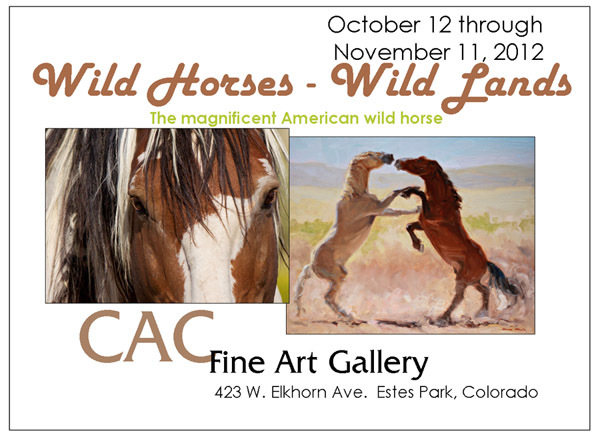 Features 2 and 3 dimensional art works reflecting the majesty and beauty of America’s wild horses. Learn about the Cloud Foundation, dedicated to the preservation of wild horses on our public lands, and the protection of Cloud’s herd in the Arrowhead Mountains of Montana. Opening Reception: 10/12/12 5 to 8 PM. Public Invited. Free. Would that I could unleash the Four Horsemen of the Apocalypse on the likes of Tom Davis. He’s the Colorado livestock hauler who’s been buying wild horses from the Bureau of Land Management at ten bucks a head, less than I spend on lunch at Panera’s. Although he’s supposed to be finding “good homes” for the animals, wild horse advocates are concerned that he’s instead shipping them off for slaughter. Given that he’s purchased at least 1,700 horses since 2009, I join the advocates in their skepticism. I doubt there are that many “good homes” for unwanted children, let alone 1,200-pound untrained animals. That comment turns my stomach. But why? I’m not a vegetarian. It’s surely the height of hypocrisy to eat meat and wear leather and yet decry the killing and eating of horses. Why should chickens, fish and cows be fair game for my palate but not the equine species? Reason one: I’m a lifelong horse nut. And I have precedent for my feelings dating back to antiquity. Examples abound of horse worship in the ancient world. The emperor Caligula so adored his stallion Incinatus that he built for him a marble stable, fed him oats mixed with gold flakes and tried to make him a senator. Alexander the Great named a city after his legendary steed, Bucephalus. Mongolians have revered ponies for centuries, so much so that horses outnumber people in their country. A horseless Genghis Khan would not have gone far. Reason two: Horses are not merely livestock. They’ve been with us for thousands of years and have likely done more to change the course of human history than any other domesticated animal. They’ve carried soldiers into battle, bleeding and dying in wars not of their making. They’ve pulled plows, drawn wagons and delivered the mail. Riderless horses have accompanied our presidents to their final resting place. Reason three: Evolving standards of decency. People are animals, too. There once were and may still be tribes who found the flesh of their fellow humans lip-smackingly delicious, but most people now recoil in horrified disgust from Hannibal the Cannibal. In America, we don’t eat each other. Nobody’s making Soylent Green. We’ve also added dogs and cats to the “forbidden foods” list. I say expand that category to include horses. Now, before every farmer and rancher in the not-so-wild West writes in to excoriate me for my sentimental city-girl squeamishness, I understand there are too many wild horses and too few homes for them. Not many people can take on the enormous expenditure of time, work and money involved in owning a horse. There’s much truth to the old saying: if you want to make a small fortune in horses, start with a large fortune. The BLM simply doesn’t have the resources to continue keeping excess horses in taxpayer-funded holding pens. I understand they can’t all be saved, as regrettable as that may be. But must we send such magnificent creatures to their deaths without even a blindfold and cigarette? Surely these fiery steeds deserve better than an ignominious death on the slaughterhouse floor. One alternative: Let them be killed humanely in a solemn ceremony, complete with banners, bugles and flowery speeches to see them off on their last journey. Let their bodies be cremated and the ashes scattered over the plains where they once ran free. Now that is a fitting end for these noble beasts who have served us so long and so well. ~Teresa Keegan lives in East Denver and works in the Denver district court system. Wild Horses – Leave them IN THE WILD !!! The whole Tom Davis thing has gotten my hackles up higher than they have always been. The Universal Laws are at work, perhaps – to make something SO bad that finally enough people galvanize and make a difference. Mis-information is generated by our political machine on many fronts…the wild horse issue is only one – but it is the one that I care about the most, silly as that may seem to many people. Two of the most wonderful arguements for leaving the wild horses alone that I have found to date follow – this one today – the next one tomorrow. This was written by Marybeth Devlin. Thanks Marybeth, where ever you are. There is scientific consensus: the horse originated in North America. It is a native species that was reintroduced in its ancestral homeland, the American West, about five hundred years ago. The horse was re-wilded. When species go extinct in a particular habitat, efforts are often made to reestablish them. For instance, elk were once the most widely distributed deer in North America. By the end of the 19th century, however, they were extinct throughout most of their range. In Nevada, elk were reintroduced in the early 1930s. With protection, the elk rebounded and currently number over 15,000. On public lands, non-native commercial livestock outnumber native wild horses by nearly 30 to 1. BLM allots approximately 8,600,000 monthly grazing units to livestock in the western states that have wild horse herds. Even in herd management areas, which are supposed to be dedicated primarily (though not exclusively) to wild horses, cattle typically get apportioned 90 percent of the grazing slots. Wild horses are not a problem or the problem. They restore the range by their foraging habits. Cattle grazed alongside equids actually gain more weight. Horses and cattle are commensals, not competitors. There is no competition among horses, deer, elk, or bighorn either. In fact, where the horse herds have increased, so have the other resident species. According to Holistic Management, to restore the rangeland, higher numbers of grazing animals are needed. A video presentation on Holistic Management is found at the link below. Multi-year studies on three different wild-horse herds disclosed that mountain-lion predation alone can keep an equine population in check. Although preaching the goal of a “thriving natural ecological balance,” BLM exterminates native predators for the benefit of livestock operators and sport-hunters. The stealth beneficiary is BLM. By eliminating the predators, BLM positions itself as the sole population-control agent of wild horses and burros. BLM creates the problem, then requests a budget to solve it at taxpayer expense. BLM officially pledges to protect the wild horses from slaughter, but has been busy creating the very conditions that put the mustangs at risk — accumulating an excess of them in captivity, while keeping the herds below minimum viable population on the range. ProPublica’s investigative report evidences that, in secret, BLM has been selling Federally-protected wild horses to a kill-buyer with long-time business connections to the Secretary of the Interior. It is time to divest BLM and defund the roundups. Return captive horses to freedom and revive the natural ecological balance on the People’s lands. An exciting week – all the Looks! have their new beautiful patinas and I am nearing completion of Leap! On Friday, Relax! And Itchy! will be in the creative hands of Deb Bakel for their patinas as well so look for new photos of them all on my website by the end of the month. So each week when I’m not sculpting – while surfing the internet, checking out potential galleries and what shows I would like to try to get juried into – always thinking about the wild horses (of course) which then occasionally leads me to think about politics…it’s interesting that they go together. And I don’t really like to put my brain into political thinking mode because it usually is frustrating and depressing to me – there are so many things going on that cannot be seen, questions I think of that I cannot find straight answers for. I didn’t think that in the beginning of my journey to sculpt our horses that I would be thinking about politics…but here I am, thinking about politics. A lot. “What would you do if you owned 180 million acres of land in the American West? Would you lease almost 80 percent of it to livestock grazers (many of them corporations) for 10 percent of its market value, only to watch livestock shear off the native vegetation, erode the soil, degrade water quality, reduce water quantity, destroy riparian areas and harm endangered species, native plants, and wildlife? When grazing fees to use your land did not cover the cost of monitoring and protecting the natural resources, would you then pay millions of dollars of your own money every year to cover the shortfall? And would you then stand by and watch as those abusing your land received additional millions of dollars in loans using the grazing privileges you granted as collateral for their debt? Bad news. You already are. On public lands owned by the American people and managed by the Bureau of Land Management (BLM), federally subsidized livestock grazing is rapidly destroying the vitality of our native ecosystems. There are many good arguments against continuing federal public lands ranching, including myriad economic and fiscal arguments. This report details another one. Collateral for private bank loans?…..interesting. It’s a bit outdated – not reflecting where our current president would be, or those running for the GOP nomination…but it isn’t too hard to figure out where to put them. This is the last paragraph of an article written by George Lakey called “How Swedes and Norwegians Broke the Power of the ‘One Percent’”. It’s thought provoking to be sure and this particular article is in a lot of places all over the internet – it seems that the Occupy Wall Street movement latched on to it. Regardless of how you feel about OWS, though…read this article. I believe history can teach us very relevant-to-today lessons. This could be one. ha ha ha ha ha!!! !